I am not one that loves to spend a lot of money on clothes (I don't for me, but especially for the kids who outgrow items so fast). I was thrilled when I found out about an online consignment store - I Spy Clothing . “New with tags” – items that are unworn, in perfect condition, with tags. “Like new” – items that feel/look new but do not have original tags. “Gently used” – items that are in excellent used condition. “Well loved” – items that show some signs of wear. They are clean with no rips, tears, stains, or holes, but have been well loved as is reflected in the lower pricing. I was in contact with I Spy Clothing, and they offered me a credit and free shipping in exchange for a review of their site. Off I went to check it out and see what they offered. Navigating the site was fairly simple. I chose the boy section, and then they have sub sections where you can search for specific items (outerwear, tee's, bottoms etc) They also have buttons you can choose so you only see items in the size you are looking for. They have many, many, many items and more are being added everyday. With my $50.00 credit, I was able to purchase the above snow pants, winter jacket, 2 shirts and a pair of fleece pants. Shipping was really quick - I placed my order on a Friday and had my items Tuesday afternoon! At the moment, they accept clothes for consignment at a drop off location in west Toronto. They are working on setting up a mail bag program for out of area consignors, but that is not in place just yet. Checkout was simple and straight forward. There is an option to input a coupon code (and they are so kindly offering Tales of Mommyhood readers a 25% discount - just enter TLSOFMOMMYHOOD25 at checkout! Have you purchased from I Spy Clothing? If not, I suggest you give it a try! Wow! I have shopped at consignments before, but never online. I love that they have a rating system for each garment and that they ship so fast too! My son's entire wardrobe was bought on consignment when he was young and it saved our family so much money! We have a few stores but not many where I live, but this is cool. I wish I could use it but my son has sensory disorder and has to try on clothes before we purchase them. But for parents looking for gently used clothes why not eh... it's a great idea! my oldest didn't have a sensory disorder, but he did go through a phase where he would only wear fleece - he just couldn't stand the feel of anything else on his legs....I can imagine how hard it must be to find fabrics he can handle :( thanks for stopping by! This is a great way to recycle clothes and get some money! I have so many clothes still with tags that don't fit my son. 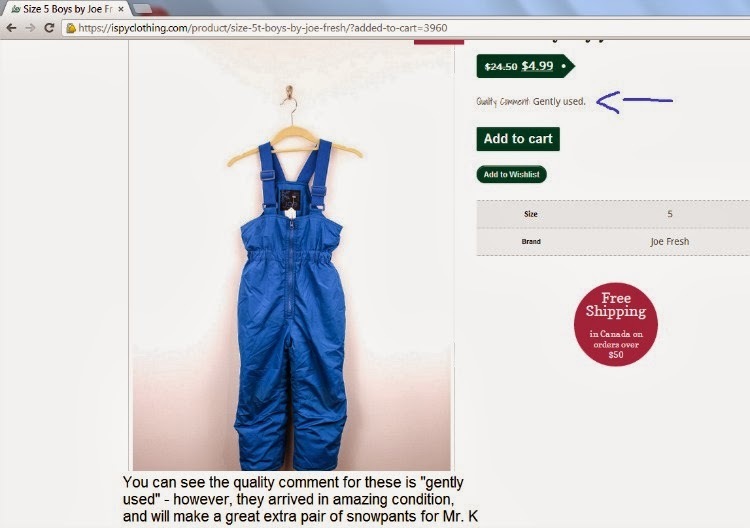 It looks like your $50 credit took you very far, and $4.99 for snow pants is a steal! I've never used an online consignment store before, so I appreciate your review of their service. YES! and if I hadn't purchased the winter jacket, it would have gone even further! I was really nervous at first, but after seeing the items I received, not anymore! I think my favourite things about this site is the list of different levels of newness!! This is a great way to be reasured about what you are getting! Mine too! Takes the guess work and worry about the quality!